A valid prescription is required to buy Eviana online. Eviana® is an oral birth control medication that contains a combination of Estrogen and Progesterone. The Estrogen side of the medication is made up of the Estradiol derivative called Estradiol Hemihydrate. The progesterone side of the medication is made from synthetic Progesterone called a Progestin. The particular form of Progestin in Eviana® is called Norethisterone Acetate. Eviana is sold under various brand names like Kliofeme, Kliogest, Kliovance and Novofem. Estradiol (Estrogen) is an essential hormone for women of reproductive age and post menopause. Eviana® is prescribed to women going through menopause as it can help reduce menopausal symptoms like hot flashes and depression. When you go through menopause your Estrogen levels drop because production of the hormones slow down drastically. This means that your body is left with too little Estrogen. Eviana® is a form of hormone replacement therapy as it replaces the hormones which are not being produced by the body. It’s like an Estrogen top-up so your body gets more sufficient levels of Estrogen to work with. 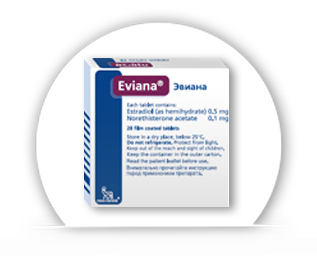 Eviana® is similar to Estrofem®, although Estrofem only contains Estradiol whereas Eviana® also contains Progestin. Estrofem® is a vaginal tablet and Eviana® is an oral tablet. Doctors also use Eviana® in post-menopausal women as a way to prevent osteoporosis in postmenopausal women. Eviana® comes as tablets and should be taken orally with water. Deciding on the right dosage is complicated as it depends on your circumstance and medical history. A normal women will likely be told to start taking Eviana® on the 5th day of their cycle and continue taking it for anywhere between 10-14 days. After completing the 28 day menstrual cycle the process is normally repeated. It means that you don’t take the full 28 pills supplied with the pack. If you have had a hysterectomy then the dosage is different. You can likely start taking Eviana® at any point and should complete the full packet of pills. After it’s finished you begin a new packet. Consult with your doctor on the correct dosage for you and follow it closely. Do not decide on your own dosage. Be sure to check with your doctor if you have any questions about your dosage, and only take it as instructed. Eviana® contains Estradiol and it can sometimes causes side effects. Most of the side effects caused by Eviana® are not that serious and only occur at the beginning of treatment while your body is adjusting to the new hormones. If the symptoms are continuous then consult with your doctor. Most of the time, they are fine and just require monitoring. This is to make sure that they don’t get gradually worse and turn into something more serious. Common side effects include itchy skin, changes in the growth of hair, tenderness or enlargement of the breasts, cramps in one or both legs and Oedema. These side effects are very common when taking birth control or other hormone replacement therapies. Serious side effects are less common but they do happen so you still need to be aware of the risks. Signs of serious side effects include pain in the legs, blood clots, severe headaches, problems with vision and lumps on the breast. Other signs are listed in the packet insert. Always inform your doctor of previous and current medical conditions when you start taking Eviana®. Eviana® can have adverse side effects on women with other medical conditions so it might not be suitable for you to take. Eviana®, like all hormonal treatments, can increase your chances of developing breast or ovarian cancer as well as other serious diseases. Eviana® does not increase your risk more than these other treatments. Make sure you discuss the benefits and risks of taking Eviana® with your doctor before you start treatment. It’s also advised to stop smoking while taking Eviana® so your risk of developing heart disease, high blood pressure and blot clots does not increase. Eviana® may interact with prescription medications, antibiotics, over the counter medication, vitamins, minerals and herbal products. It’s best to avoid new medicinal drugs when you are on Eviana®. The information about Eviana® on this site is purely educational; it does not replace a doctor’s consultation.